'Fancy Me This' ( Marty Schafer and Jan Sacks, R. 2012) SIB, 31 (79 cm). Early midseason bloom. 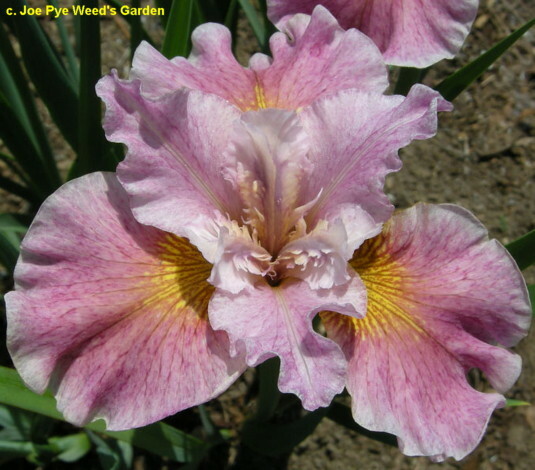 Standards light pink; style arms pale pink to white, some feathering; Falls pink, small yellow signal, heavy self veining; slight sweet fragrance. 'Sandy River Belle' sibling. Joe Pye Weed 2012.
jpg IMG_5731-X2_fancy_me_this.jpg manage 175 K 20 Feb 2016 - 23:17 BrockHeilman Please contact Brock Heilman for image use.